So I've become addicted to running. I was always that girl that hated running if it was not after something (like a ball) or away from something (like a tuna fish sandwich). I just did not get it, but I wanted to. I wanted to prove to myself that I could be a runner. My friends inspired me and I started the couch to 5k program a few months back and now I run 3 miles 3-4 times a week. There were a few bumps along the way, but finally hitting my 3 mile goal was a big milestone. My next goal is to run a 1/2 marathon and since I am obsessed with music, I found the perfect race. 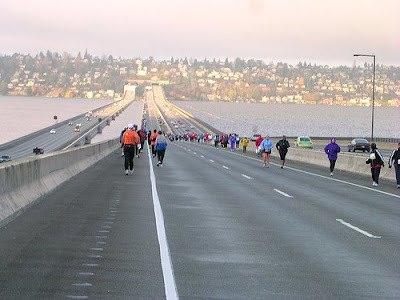 The Seattle Rock n Roll Marathon and 1/2 Marathon. They have live bands all along the course and the race ends with a concert. It's like the running god's read my mind. I'm registered and going to set my training schedule up next week, but I am challenging all of my readers to run this with me. The race is not until the end of June so there is plenty of time for you to get in shape. I guarantee that if I can be a runner, so can you. Do it. Make this your 2009 goal and run with me. Yay you! We'll see you there! That is awesome! That would be a fun one to do. Congrats! Running can be addicting- starting is the hardest part. Have a great Christmas! I'm going to need to know about this training schedule you started miss... as soon as I can get this baby out of me..and be able to walk again--I want to run my little brains out! Your story sounds like mine! And I did it and I survived and now I am on to a full marathon!! Congrats on taking this step. I honestly believe the first 3 miles are the hardest and you're already there! I wanna too, but my knees say otherwise. How about I meet you at the finish line with my camera and a donut? I love the fact that you are running!